Last week, I experienced a new use for playing cards. I’ve been taking a weekly exercise class that’s actually very fun. (That’s sort of an oxymoron isn’t it?!) Anyway, here’s the fun part: what we do each week is a surprise! Last night, our instructor used playing cards. He assigned an exercise for each suit (hearts, clubs, spades, diamonds). The cards were shuffled, and we began. When a four of diamonds was pulled, we did four reps of the diamond exercise. A face card equaled 11 reps; an ace was 12. Wouldn’t this be a great way to incorporate a bit of physical activity into the school day? You could do jumping jacks, toe touches, squats, and lunges; or you could do any combination of movements. And trust me, in only a few minutes, the ole heart rate is accelerated! So what ideas do you have for using playing cards in the classroom? Please share! That sounds fun!! Thanks for sharing the idea!! Besides using playing cards in a game similar to “war” to distinguish number quantities that are greater than or less than, I also used them to choose random partners. 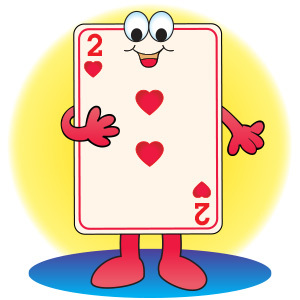 For example…Pick a card and the 2 red tens, or the 4 sevens… are partners or working together on a team project. For older students have each child draw four cards to make fractions. They add the fractions (or subtract) and the child with the higher sum or difference gets all four cards. I also use them for a game called fraction action. You have circles or squares cut into equal parts ( 1/2s, 1/3s, 1/4s, 1/5s, 1/6s, 1/8s, and 1/10s) You turn over two cards and that becomes your fraction. You color in the number of parts and the person with the most shapes filled in wins the game. I do also use cards to make partner pairs or small teams. At the beginning of the school year we play “Which one is bigger or smaller?” The students work with a partner and use cards 2- 9 from the deck. They take turns and flip card over. Sometimes I have the partners compare their cards and then the higher or lower gets both cards – according to what goal I am working on. We use playing cards in my pre-k class in several ways. I remove the face cards first. Then we use the deck to match numbers, sort by shape and order numbers by suit. We also play “war”; sometimes it’s the bigger card that wins and other times it is the smaller card that wins.